The place won’t look this empty much longer. A new supermarket will open this summer. Preparations for a long-awaited new supermarket in the North Albany Village shopping center are coming along, and the owners are shooting for opening it this summer — they hope by June. Tyler Myers, president of The Myers Group, told me this morning his company has been making “good progress” in planning for the new store, which will open in the space left vacant when Ray’s Food Store closed in December 2013. 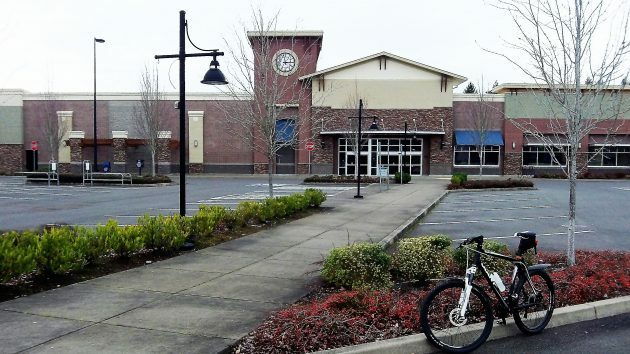 The 30,000-square-foot market will occupy most of the interior space, and the rest will house an Ace hardware store. In addition, Myers said today, the store will have a pharmacy. He’s still working on “something else,” which he said might well be a bank branch. Myers told me most of the store equipment is already in the building. His company has been working on the architectural plans for the inside of the space and is about to file them for a permit with the Albany building division. Meanwhile, the Portland architect for the shopping center development company filed, on March 6, for a permit for “tenant improvements” including two new doors, a new exterior slab and fence (presumably to accommodate the outdoor section of the Ace operation), and upgrades to comply with the Americans with Disabilities Act (ADA). That’s according to a notation in the building’s division’s website. I asked Myers what the new store will be called. “Good question,” he said. He hasn’t settled on a name but said it will surely have North Albany in it, like North Albany Market. This is such great news. Thank you for the update! When this store was Ray’s Market it felt small compared to other grocers and I felt the selection was limited. Is the developer planning to put a grocer, hardware store, bank branch and pharmacy in the same footprint as the previous Ray’s? Or will these be in adjacent space? I appreciate the update HH. I look forward to spending some hard earned cash there when they open. Probably not day one but soon after.